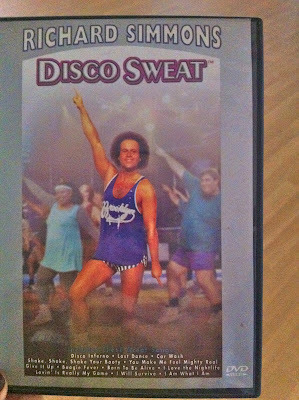 This afternoon, I discovered a bunch of workout dvds in the dance room. One caught my eye because it was particularly cheesy/90's style aerobics. I picked it up and said to my class, "Aren't you all glad I didn't make you do this workout??" One student said, "Wow, that lady looks crazy". I responded, "Actually, that lady is a man and his name is Richard Simmons."